Are you ready for a SUPER charged weekend? Yeah, me too! We've got everything from ballgames to rodeos planned and I even had some judging of scrapbook pages at the local county fair thrown in there. Busy, busy, busy, but not TOO busy to get in a little crafting time. I created this beautiful shaker card for our DT challenge at Flower Soft. We were challenged to create a shaker card using Flower Soft products, so I pulled out the Christmas Snow Globes Christmas Card Toppers and set to work creating a snowglobe card. I followed the instructions HERE on Splitcoaststampers to create my card, and I just changed the shape from the instructions to an oval. I got to try out a new product for this, and I've got to tell you that I have a new favorite! When placing the foam around the edge of the oval, I used this Kool Tak Clear Foam (yes, you read correctly... CLEAR) 3/16" x 1/16" double sided sticky tape. Folks, this stuff is REALLY sticky and if found that it was easily stretchable, making it a breeze to place the tape around the oval without having to cut it, which creates seams and the potential for the pretty "shakey stuff" to fall out. It was GREAT!! The images on these card toppers are preprinted, so there's no coloring at all, which made this a SUPER easy project that went together fairly fast. I did use some of the Kool Tak foam pads in a couple of sizes to layer the printed pieces of paper that I hand cut, and before sealing my shaker card, I added some sparkle to the snow and filled my shaker card with Flower Soft Polar White. It's an amazing pure white look with an ever-so-subtle translucent sparkle to it. SOOO pretty!! To finish off this card, I dry embossed the white panel using the Stampin' Up! Snowflake embossing folder, and added some pearl embellishments. The final touch was the preprinted sentiment, which I hand cut and attached using Kool Tak Foam Pads. I hope you enjoyed this pretty peek of Winter in the midst of Summer. It won't be long and we'll be needing these holiday cards for sending out! Gorgeous Card. Love the coloring of course my friend. This looks Awesome. Have a wonderful weekend. Lorie this is so BEAUTIFUL!!! Love it! So, so, sooooo beautiful! I love the scene, all the pretty embellishments, and the embossed background. Thanks for the tip on that clear foam sealer, that is something I will definitely be checking out. Good luck and have fun with all of your weekend activities! Absolutely gorgeous, Lorie. I´ve never tried this technique but it looks very pretty. 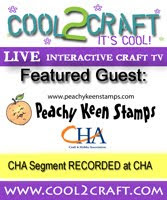 Christmas In July at Peachy Keen Stamps!! CHRISTMAS IN JULY :: PKS SALE!! !